Researchers have spotted the surviving companion — and possible cause — of a supernova explosion from a dying star. Astronomers saw supernova 2001ig flash into brilliance 40 million light-years away in the galaxy NGC 7424 several years ago, and after the supernova faded spotted its companion star with the Hubble Space Telescope. The surviving companion of a star that went supernova 17 years ago from Earth's perspective shines in a new view from NASA's Hubble Space Telescope. And the blowup may have been that companion's fault. The star explosion, a supernova called SN 2001ig, occurred 40 million light-years away in the galaxy called NGC 7424, which is located in the southern constellation Grus, the Crane. The new Hubble images reveal a second star — the supernova's surviving companion — which suggests that some supernovas originate in double-star systems, according to a statement from NASA. "We know that the majority of massive stars are in binary pairs," Stuart Ryder, lead author of the study from the Australian Astronomical Observatory (AAO) in Sydney, said in the statement. "Many of these binary pairs will interact and transfer gas from one star to the other when their orbits bring them close together." SN 2001ig is categorized as a Type IIb, stripped-envelope supernova because nearly all of its hydrogen was siphoned off before the explosion. This type of supernova is considered to be fairly unusual because scientists are not entirely sure how the star systems lose their outer envelope. Earlier studies suggested that this type of supernova originated from single stars with very fast winds that pushed off the outer envelopes. However, astronomers have struggled to find evidence of primary stars responsible for such explosions, according to the statement. "That was especially bizarre, because astronomers expected that they would be the most massive and the brightest progenitor stars," Ori Fox, a researcher from the Space Telescope Science Institute in Baltimore, said in the statement. "Also, the sheer number of stripped-envelope supernovas is greater than predicted." Instead, astronomers attribute the lack of hydrogen to primary stars that were once part of a lower-mass binary pair, according to the statement. 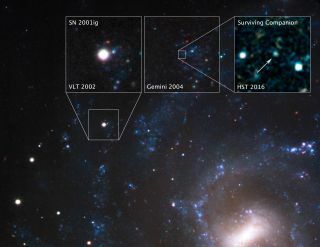 Using the European Southern Observatory's Very Large Telescope (VLT) and the Gemini South Observatory in Chile, astronomers were able to identify the exact location of the supernova. Then, the researchers were able to direct Hubble's view to that region of the sky, where it finally found the surviving binary companion. This is the first time a surviving companion has been photographed, the researchers said. "We were finally able to catch the stellar thief, confirming our suspicions that one had to be there," Alex Filippenko, astronomer at the University of California, Berkeley, said in the statement. However, photographing a supernova's surviving companion is no easy feat. The companion star is so faint that it likely would not have been spotted by Hubble if had been a few more light-years away, according to the statement. The new findings, published March 28 in The Astrophysical Journal, suggest that as many as half of all stripped-envelope supernovas have companions, while the other half lose their outer envelopes via stellar winds. Going forward, the team members plan to use the powerful James Webb Space Telescope, launching in the next few years, to continue their search for stripped-envelope supernovas and their surviving companions.